If the world doesn’t get its act together soon, we will face rising seas, heat and drought, and stronger storms. No nation will be able to escape the consequences of climate change, but Small Island Developing States (SIDS)—such as the Maldives, the Marshall Islands, and the Bahamas—will be some of the hardest hit. “Many of these countries are located at or entirely below sea level,” explained Lisa Dale, a lecturer in Columbia University’s Undergraduate Program in Sustainable Development, during an event on Thursday night. SIDS are “on the frontlines” of how this planet will navigate the extreme impacts of climate change, she added. The United Nations estimates that 250 million people will be displaced by climate change by 2050. Where those people will go remains a thorny issue, as do questions about who is responsible. The U.S. and China have emitted the most greenhouse gases over time—what role should they play in helping at-risk nations? These were just some of the questions addressed in Thursday’s event on climate change and SIDS, hosted by the Earth Institute’s Climate Adaptation Initiative and moderated by Dale. ‘Retreat’ is a word that frequently comes up in conversations like this—the idea being that people will need to move out of the lands that are most at risk. But it’s a word that doesn’t sit well with the people who actually live in these areas, said Tearinaki Tanielu. He’s an environmental scientist and policy researcher, and a native of Kiribati a chain of islands and atolls in the Pacific Ocean. Tanielu represents Kiribati in the U.N.’s Alliance of Small Island States. “Having people taken away from their islands is something that is quite unfair,” says Tanielu. Kiribati hasn’t generated the emissions that threaten to drown its chain of islands and atolls—so why should it suffer the consequences? For many of us, climate change still seems like a vague threat, happening sometime in the future in some distant land. But small island nations are already feeling the brunt of the changing climate. 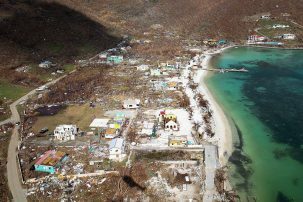 In 2017, the Virgin Islands were hit by 200 mph wind gusts from Hurricane Irma, damaging 90 percent of buildings, destroying 30 percent of schools, and causing the worst floods in the islands’ history. It took six months to fully restore power. “The aftermath literally resembled a bombing,” said Angela Burnett, the climate change officer for the Virgin Islands’ Ministry of Natural Resources and Labour. Burnett cited some disturbing statistics. In 1990, scientists estimated that a storm as strong as Irma would only hit once every 800 years. By 2017, the odds had shot up to 1 in 180. And if we don’t dramatically curb our carbon emissions, by 2090, it could be 1 in 60. 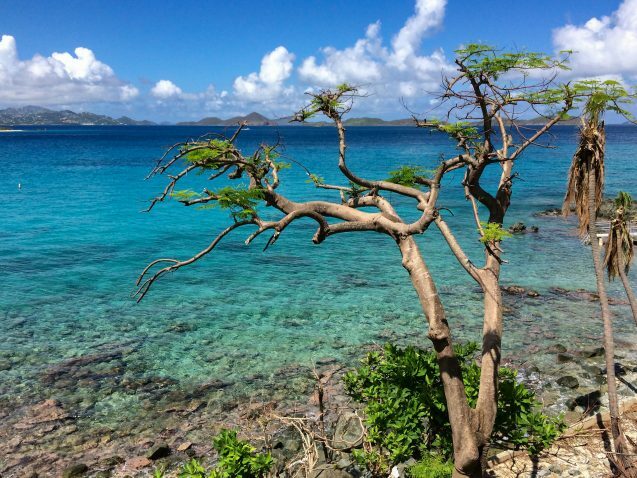 The Virgin Islands are mountainous, so it is theoretically possible for people to escape the rising seas by moving inland. But “it might not be a practical option to just think that you’re going to pick up entire communities with large populations and put them somewhere else,” said Burnett. In some cases there’s nowhere for the buildings to go. It’s also very expensive to build in the mountains, she said, and it creates other challenges like erosion and sedimentation. Burnett called for more “blue sky planning”—meaning detailed planning done before a disaster strikes, so that retreat and resilience measures can be incorporated quickly and easily in the aftermath. But Tanielu said he didn’t want to talk about the word ‘retreat.’ For Kiribati, a nation built on narrow atolls, retreat isn’t a real option. “Where can you retreat?” asked Tanielu. “If you move forward, you run into the beach. If you move backward, you run into the other beach.” For his country, retreat means abandoning the land where his ancestors lived for thousands of years, and leaving behind the graves of his parents and grandparents. Instead, Kiribati is focused on cutting carbon emissions and finding innovative ways to continuing living on the islands. They are looking into building resilience and fortifying the least at-risk areas by building up the land in the area around the capital, for instance, although those projects can be very expensive. To Tanielu, retreat should only be considered after all the other options are exhausted. Radley Horton, a climatologist at Columbia’s Lamont-Doherty Earth Observatory, pointed out that scientists are starting to be able to say how much climate change has affected the probability of an extreme weather event. With these advances in attribution science, we may not be that far from being able to blame some portion of these events on the emissions from certain countries or industries. “Will it ever get to a point where someone could actually be forced to pay for the retreat or resilience? I don’t know,” he said, deferring to legal experts. Burnett advised that if we want people and nations to reduce their carbon emissions, the first step is to “connect people in a personal way to the history of climate change… Because we only act on the things we care about, and we only care about the things that we feel personally connected to.” From her book, The Irma Diaries, she shared some true-life stories from Hurricane Irma survivors—harrowing accounts of people saying goodbye to their loved ones as they sheltered in bathtubs, and swimming through waves that as tall as two-story buildings. This event was part of the Earth Institute’s Climate Adaptation Initiative—a three-year project to enhance Columbia’s impact on sustainability problem-solving. One of the themes of this initiative is climate-induced retreat to safer areas. Learn more here.